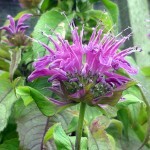 We are nearly in the last week of June and this is a great time to sow seeds of perennial and biennial flowers. If your not sure of the difference between perennial and biennial, here is the answer. Perennial means that the plant grows in it’s first year, [ sometimes even flowering ] then lives for a number years, flowering each year. They often shrink down to a low clump that lies sleeping over the winter, then grows up again each spring. Some flowers like Aquilegia, may only last a few years, others like Oriental Poppies and Delphiniums can last for decades. Biennial means the plant grows in it’s first year, putting on leaves and green growth, then flowering in it’s second year, setting seed, then dying. They can sometimes be encouraged to grow for another year if the flower spike is removed before setting seed. 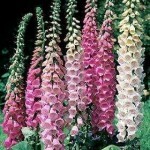 Examples are, Foxgloves, Campanula [ cup and saucer types ], Mullain and Honesty. 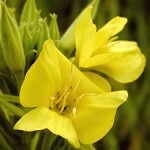 Many of these biennials will set seed and happily self sow around, so you will get them growing and flowering for years. Some may need help. I like to sow thinly in a half sized seed tray in ordinary multi-purpose compost that I have watered first. I then cover with vermiculite or course grit. 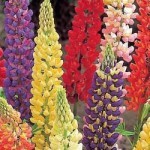 Many of the these flower need light to geminate, for example, foxgloves and poppies. So a light sprinkle with vermiculite or grit will hold the seed in place, but still allow light through. 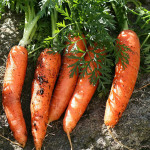 Place in a cold frame, greenhouse or in shady corner of the garden, protect from birds and pests. Some will germinate within a couple of weeks, others like Aquilega may take a month or two, so be patient. I like to wait till the seedlings have their second set of true leaves before potting on, either into individual pots or, I like to use module trays. 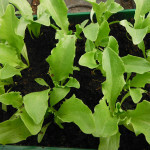 Grow seedlings on out of full sun till ready to plant out in early autumn. This will give the young plants time to get established before winter. When you have these flowers established in your garden, an easy way of keeping them going is to self seed, maybe with a little help. I go round the garden during the flowering time with some coloured wool or string. When I see a flower I like, I tie a piece of string or wool around the stem. This reminds me that this is the seed I wish to save or self sow. I will cut out all other flower stems , then when the seed is ready, I either harvest the seed to keep, or scatter the seeds where I want new plants to grow. It couldn’t be easier. If you do save some seed, dont keep it in plastic, keep it in a small paper envelope. Here are some flowers you could try, there are losts more. * Sometimes grows as a short lived perennial. Sowing Hardy Annuals in Autumn. The Aquilega have flowered beautifully and early this year. I have already got seed pods which are not so attractive. Can I cut them off now and leave the seeds to ripen on the stems which I would lay down in parts of the beds where I want aquilega next year. Will I harm them if I cut them out now.